This article was written for the Global Plant Council (GPC) and originally entitled “A Postcard From… The Australian Society of Plant Scientists”. It first appeared on the GPC blog. You can follow GPC activities on twitter @GlobalPlantGPC”. The Australian Society of Plant Scientists (ASPS) promotes plant science in Australia, and provides professional contact within our community of teachers and researchers in plant biology. Originally fo­unded in 1958, the ASPS currently has approximately 400 members from Australia and also overseas. It provides a forum for knowledge exchange so that the membership can build on both the depth and breadth of knowledge of plant functions. ASPS offers a unifying representation of plant scientists in Australia, and is linked with the Global Plant Council and many other important international plant science organizations. One of the main activities of the ASPS is to provide mutual support and collective mentorship to facilitate the dissemination of new research. For example, there has been a long and mutually supportive interaction between ASPS and Functional Plant Biology, which is perhaps the most prestigious journal of the Commonwealth Scientific and Industrial Research Organisation (CSIRO). ASPS is one of the foundation partner societies of ComBio, the annual international biology conference held in Australia. ASPS also sponsors other specialist workshops upon request. The Society aims to nurture a new generation of plant scientists in many ways. It sponsors student attendance to ComBio through travel awards, and encourages active student participation by awarding poster prizes. Additionally, the RN Robertson Travelling Fellowship is available to students and early career researchers to support their research in another laboratory so as to widen their experience and raise their profile. ASPS rewards excellence at all levels of scientific career development. Eminent plant scientists are invited to give the JG Wood or RN Robertson lectures at ComBio, in honour of the first two Presidents of the Society. Outstanding young plant scientists are recognized every year by the Peter Goldacre Award and the ASPS–FPB Best Paper Award. The commitment of ASPS to plant science education is reflected by both the ASPS Teaching Award, which recognizes innovative contributions to undergraduate teaching, and the development of online resources for plant biology teaching such as Plants in Action. The Society’s social media platforms work with members to enhance their ability to do research and to educate others in plant sciences. The ASPS website offers the opportunity to connect with other members, get updates on the latest plant science research around the world, post jobs, student scholarship opportunities and conference announcements, and provides a growing collection of teaching resources for plants sciences. Phytogen is the Society’s newsletter blog to inform our own members and general readers with an interest in developments in Australian plant science, provide a vehicle for communicating new ideas, recent professional experiences, and forthcoming events. 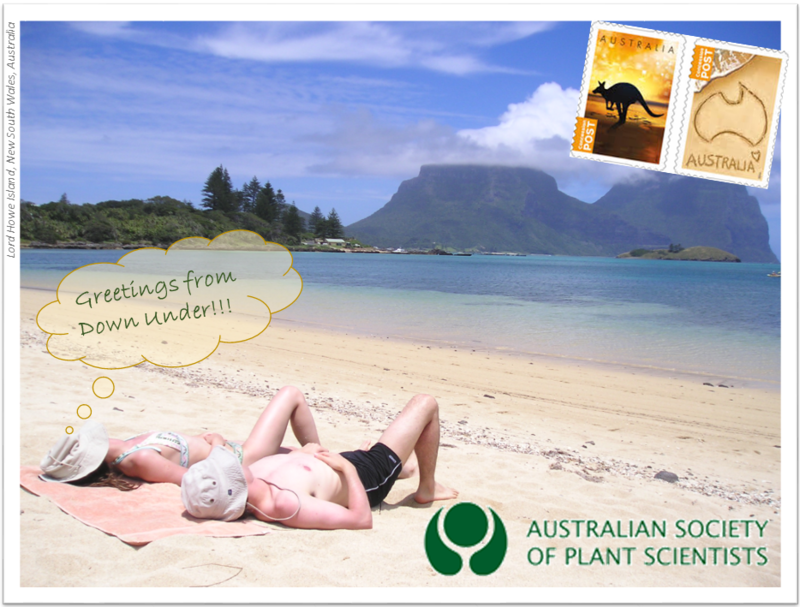 Finally, we use our Facebook and Twitter (@asps_ozplants) accounts to interact and engage with both scientific and general audiences. Meet us and view our photos in our ASPS Facebook page! This pioneering ‘Postcard From’ was prepared by Gonzalo Estavillo and John Evans.